The blog will be on a short hiatus until Monday. Several comments have come in regarding broken links in posts. Often when the posts are written it's the wee hours of the morning and the available links are posted by staff at the end of their day to the web. In many papers, when the print edition comes out later in the morning, the print version of the story is fed onto the website with a different URL and the version posted the night before expires. I will do my best to keep up with any changes in URLs overnight, but you may have to go poking around if the URL doesn't hit the right spot. Ideally, in a perfect world, I'd do all my blogging during better hours and the links would remain intact. I apologize for the inconvenience. Another three quicker hits this evening on some matters touched on previously. The Star posted this late story (note the link may expire when the print version of the story is fed to the website overnight) Tuesday on the board decision to close a Corpus Christi. The reporting fairly conveyed the events of the meeting, including the parents' reaction. Will they all march out and enroll in the public board? This is a threat I hear uttered often in public meetings, one that is just as often never acted upon. The decision was upsetting for several Corpus Christi parents, who staged an 11th hour fight to keep the Robinson Drive school open. If that's the case, perhaps the 'battle' should have started earlier. The attempt to give Niagara District Secondary School in Niagara-on-the-Lake a year's reprieve on an innovative attempt to allow time for enrolment to grow was shot down Tuesday night, according to this Standard story (again, note the caveat above). Niagara District’s future has been in question for at least a decade as its enrolment continues to dwindle. The board has already decided to shut down the school by the end of the next school year, if its enrolment isn’t at least 350 students. Current enrolment is about 100 shy of that mark. When the vote failed, area trustee Gary Atamanyk and colleague Lynn Campbell notified their peers they had a couple more attempts up their sleeves. Campbell's five-year reprieve is ridiculous, and only spares the school's current students from the consequences of the decisions that led enrolment to where it is today. Atamanyk's however, has promise-- particularly since the board's open-busing rules are a big part of why most of the 700 high school-aged students don't attend NDSS. The 152-year-old school is battling declining enrolment, expected to drop from 145 to 100 students in the next decade, and needs $3.1 million in building upgrades. But it’s in an area that both city officials and school advocates say is en route to growth and renewal with the advent of new housing developments and plans for a new performing arts centre. Those are a lot of challenges to overcome in three years. Remember "en route to growth and renewal" and a "performing arts centre" do not mean SFA when it comes to increasing school-aged population in the numbers needed to make a difference. Interesting to see another different solution come out of a Niagara school board however-- and to see whether the Niagara Catholic District School Board finds itself in the same quandary as its public cousin does with NDSS. I'm still keeping tabs on education-related stories that are popping up, but the cold reality is that today I don't have time to write an individual post about each one of them. So, here's my shotgun approach to throwing out a bunch of links and a few words about each of them. Owen Sound providing the latest in its continuing coverage on the review underway. It appears notes on the meeting aren't yet public from the meeting last week in Owen Sound. The Star has this preview on the pending vote by trustees on several Catholic schools, where there are recommendations for closure and consolidation coming from both staff and the review committee. The comments at the bottom are particularly interesting. A radio station report on Ontario Minister of Education Kathleen Wynne's May 22 visit to Strathroy District Collegiate Institute / Holy Cross Catholic in Strathroy. There's plenty of context I hope the minister was briefed on, such as how the boundaries keep shifting to keep the Catholic side full. Or how the public board just completed a huge expansion there last year. Or how the experience of building this school has scared the two boards away from voluntarily co-operating to build a similar joint facility at the elementary or secondary level again. The eventual storyline after accommodation review commitees and board votes, etc. is the school obit story where we reminisce and retell and remember the days. The Brantford Expositor has done so (on its front page, no less) for a middle school set to close at the end of this year. This one in Tuesday's Toronto Sun is scary-- the appointee is making the decisions the trustees can't make because of their failure to do their jobs. Eep. The Echo has this story of a review of schools in Wilberforce and Cardiff-- complete with mouse-dropping and mould inspections and a former principal saying the other school's students and staff have worse morals. Ouch. These sentiments are present in other reviews I've covered ("us" versus "them") but people are usually more restrained and keep it to themselves and their communities-- not in the public record. The Community Press (Stirling, Ont.) has this story about a board vote on an accommodation review. What's interesting is the trustees did not fully accept their staff's recommendation, voting instead for an alternate recommendation presented by the committee. So, you see, some times, the process of providing recommendations to trustees that aren't NIMBYism or don't ignore the realities can actually be accepted and supported. What a concept. A frequent if anonymous tipster sent this one in by e-mail. It's another plum pick from the Society for Quality Education, probably the closest thing Canada has to a U.S. style school-choice lobby group for education. In a May 2009 analysis completed by SQE president Malkin Dare, she uses the annual Ontario Public Sector Salary Disclosure Act to bolster the society's case that school choice and charter schools are the cure for all of the ills of publicly funded education. The longer I looked at it the more I wanted to delve, hence the length of this post. Her report contains the society's analysis of the number of the number of $100K+ salary earners in publicly funded school boards against each board's average daily enrolment as reported to the Ministry of Education. In an era of declining enrolment where public sector salaries have not been frozen or cut back, it's no surprise the ratio of $100K+ earners to students is increasing. That in and of itself is not shocking news, it's simple cut-and-paste math-- hardly worth the bevvy of exclamation marks that punctuate Dare's report. Reporting on the so-called Sunshine List is a god-send to the very people who created the legislation mandating it, the Progressive Conservative Party of Ontario and those supporters who lie even further to the right on the political spectrum. Despite the Tories being out of power in Ontario since 2003, every March/April their spindoctoring gets a big boost from the Sunshine List legislation. On the day the disclosures are released, the media is full of stories of who the highest-paid civil servants are and commentary from those who are simply galled by the increases -- both to individual salaries and to the number of people on the list. Yet the list itself is fraught with problems, the biggest and best being the very limit itself. $100K has always been a lot of money, but in the grand spectre of things, it doesn't buy what it did when the legislation was first passed. If we wanted to remain shocked about overpaid civil servants, the act should have indexed the $100K to inflation from the day it came into effect in 1996. The Bank of Canada's inflation calculator tells us that number in 2009 dollars would be $128,410.37. Or, vice-versa, if someone earned $77,875.33 in 1996 and increases had exactly matched inflation, s/he would be earning $100K in 2009. So, the bulk of those who get "added" to the list every year arrive there through no specific action on their part. They simply benefited from a cost-of-living increase. To flush out this point a little bit, I did my own analysis of the past three years' release (2007-09, covering salaries paid in 2006-08) of school boards' sunshine lists. Find the spreadsheet over on GoogleDocs if you want to take a look for yourself. None of the educators who earned $100K+ in 2007-9 were on the 2006 published list. The average increase from 2006 to 2007 was 3.64 per cent, the median was 2.8 per cent. Remember the 2007 list published salaries earned in 2006, and so on. From 2007 to 2008, average 3.96 per cent, median 3.25. From 2007-09 (three years), the average increase was 7.75 per cent and the median was 6.32. Data is always open to interpretation -- but these were the questions I asked the data in an attempt to show some of the detail it contains that SQE either didn't or wouldn't look at because it doesn't support its cause. The Hamilton Spectator reported along very similar lines on the growth of the list several years ago, but I can't find the article online. Given the year-to-year average and median increases, the salaries of the bulk of those on the lists rose each year by a number close to the inflation for that year-- or as further investigation would no doubt reveal, by the percentage increase granted in their duly negotiated and ratified collective agreements with school boards. Looking at the individuals whose percentage increase year over year exceeded the median shows either other counterparts in the same board receiving the same percentage increase (another sign of a collective agreement in place), or that the individual received a promotion. My analysis did not track whether the individual's position changed from year-to-year, but this information is stated in the Ministry of Finance reports. I don't know about you, but if I receive a promotion, I would expect the increased responsibility to come with a related improvement to my compensation package. Also, if I was a member of an employee group, I would not tolerate being held back from earning my mutually agreed-upon increase just because that puts me in the $100K+ club and the optics allow for statements like the SQE's. Here's the really fun part, and I've done this math on here before. Given the four-year deals now in effect for all school board employees, with most getting three per cent per year (except those elementary teachers...), the list is just going to keep on growing. Anyone making $88K in those employee groups on Aug. 31, 2008, just signed a deal in the last nine months that will see them reach $100K by 2012. Meaning in either 2013 or 2014, they'll be on the Sunshine List too. There are too many things built into the system(s) to keep the number of people on the Sunshine List who work in school boards from getting any smaller. Being outraged about it won't do any good unless you're prepared to wage war on the unions and get them to accept wage rollbacks -- and that simply isn't going to happen without every child in the province getting some long strike-related vacations. What we can do is make sure that boards tie their staffing to their enrolment. If a board's population decline equals fewer superintendents, trustees should be making the cut. If the board's decline means an even greater cut to administration than what the ministry is already asking for in 2010-11, do it. Even that won't solve the growing list, since in union environments you chop from the bottom up, meaning you'll be axing the $35K teachers, not the $92K ones. We can also ask for the best bang for our dollar-- which I think is what SQE is trying to point out, except the message gets clouded by its advocacy for school choice (aka charter schools and/or voucher schools). Was it really about school safety? This one is a difficult one to blog about here as it hits quite close to home. On Wednesday, the world learned two individuals had been charged with the abduction and murder of Victoria "Tori" Stafford, 8, a Grade 3 student at Oliver Stephens Public School in Woodstock, Ont. Charges stipulate Tori was abducted on April 8 by Terri-Lynne McClintic and Michael Thomas C.S. Rafferty. Those same charges accuse Rafferty of later murdering Stafford in Woodstock or elsewhere in Ontario on or about April 8, aided and abetted by McClintic. In the ensuing days, two stories (likely more exist) were published in London and Stratford relating to school dismissal policies. At the press conference held by Thames Valley District School Board director of education Bill Tucker on the front steps of Oliver Stephens May 20, the LFP reporter had no questions other than to lay into the director on the board's school dismissal policy. "Are there changes coming? Why not?" were the priority questions for the reporter. Tucker refused to answer the question that day, coming back the following day to a different set of reporters to admit the board would review its schools' dismissal policies. Other boards are now doing the same, or at least explaining their current policies. There is no information currently available to suggest Tori was abducted on school property or even within sight of the school's front entrances. She was only ever seen in the now infamous College Avenue Secondary School security camera video, which is several blocks to the north and about halfway between Oliver Stephens and her mother's house. In the time since her disappearance / abduction April 8, her mother has offered varying explanations for what the procedure was for Tori at dismissal. The school had herself, her boyfriend and one other person (not Rodney Stafford, Tori's dad) listed as the adults responsible. Yet she frequently walked to school when she was living in the co-operative housing project adjacent to the school. Since moving, mom indicated Tori and her brother were often driven to and from school by relatives. Her brother supposedly walked her home every day except for the day in question-- although this information was later contradicted. Tori also frequently, from what has been said, went to her friends' homes after school, walking with them from school. At one point early in this developing story, information was released suggesting she was actually to walk to her uncle's home in the co-operative where she used to live after school (likely to the south, the opposite direction from where Tori was seen on camera). The exact routine, if there ever was one, of her departure from school cannot be accurately confirmed at this point. During dismissal at this school, the principal and/or vice-principal, EAs and other staff supervise the front entrances of the school. These staff members load the school's buses and monitor the other students as they are either picked up by adults or walk to the homes in the neighbourhood (the board's walking distances are all over one kilometre). With the typography surrounding the front entrance of the school, the supervisors can see up the hills to the edge of the school property to the east, south and north. If Tori was to walk home by herself that day, staff would have been able to see her as she walked to the sidewalk and then proceeded north. The security camera caught her walking on the other side of the street adjacent to a retirement residence-- out of the line of sight available from Oliver Stephens. I have opined on this in an earlier post-- Tori's abduction had nothing to do with school safety. There is nothing to suggest the abduction occurred either on school property or within sight of anyone supervising dismissal from the front of the school. Short of having staff hold the hands of every student who walks home from school, how could any change in procedure have produced a different outcome? Further, where do we draw the line? Where is the line in the commute between school and home where the school is absolved of its responsibility and the parent assumes responsibility for the child's safe arrival at home? In a transient environment like the one it's suggested Tori lived in, who's responsibility is it to ensure the school is kept apprised of changes in guardianship, dismissal, arrival, etc.? Tori's abduction didn't happen because Oliver Stephens' has or had lax dismissal procedures. It happened because twisted, sick individuals (hopefully the two currently accused and in custody) chose to take her and commit a most horrible crime. While a review of policies -- especially after a situation like this -- is always welcome, let's not lose sight of how this tragedy actually occurred. This article out of Owen Sound touches on parents' views for the relocation of a primary playground and expansion of the school parking lot. The need for an expansion to the parking lot is completely understandable. With walking distances and the 'evolution' of parenting, many parents drive their kids back and forth from home to school and vice-versa. Many older schools simply weren't configured for this, leading to traffic and parking lot chaos around elementary schools at arrival and dismissal times. Modern or renovated schools often now have kiss-and-ride lanes for parents to pull through as they drop off and pick up their charges for the day. So these expanded parking lots, etc. are required. I wonder if the parents involved in the opposition to the relocation of the primary playground understand this-- would they be willing to let their kids walk (or walk their kids) to school to avoid the need for an expanded parking lot? It's doubtful they're willing to change their behaviour to accommodate this. Yet, this doesn't appear to be the only issue at play. Parent Rhonda Brown sits on the parent committee and opposes the loss of the playground, which she said in an interview Thursday she thinks will force the school to move to the balanced day format of two nutrition breaks, instead of lunch and two recesses. Primary students play in the front of the school, while older students play in back. The loss of one yard would require all kids to use the larger, remaining yard. Doing that would require changes to the school timetable, such as those proposed for next year's balanced day, so not everyone is on breaks outside at the same time. Otherwise, smaller students would be put at risk from collisions with bigger kids, stray soccer balls and such. This appears, then, to be a modified version of the balanced day that would see primary students have different recesses than their junior and intermediate peers. Many other balanced-day schools still have all the students out at once, and many schools with only one yard manage to divvy up the panels to keep students from unnecessarily mingling and putting each other at risk. So then, how much of the opposition to the lost playground is actually opposition to balanced day? The article doesn't make it clear. Read this Brantford story with some interest before jetting off to the NNAs Friday, regarding the changing of the guard in principaldom within the Haldimand-Norfolk-Brant Catholic board. I feel for these students, I really do. A good principal can really shape a school and its culture. While in most secondary schools principals are more administrators than instructional leaders or disciplinarians, they create the culture and set the tone followed by vice-principals and the rest of the school staff. A bad principal can sour a school and impact on students, vice-versa a good principal. The students at St. John's College appear to have lucked out and gotten a principal they admire and respect. There's one question that remains unanswered in this story, an obvious news hole for reporter Susan Gamble and her editors. What does principal Dina Dalia actually think of her transfer? Did the Expositor ask her? If they did and she was unable / unwilling to answer, Gamble should have put that in the article. Instead she included only quotes from Dalia's comments to students during the walkout and then from the board's communications staff. This is entirely not related to this blog or its purpose, but I had the opportunity to attend the National Newspaper Awards gala in Montreal Friday night. It's always inspiring to see what constitutes the best in newspapering every year at this gala, and to keep the running tab on the Globe and Mail vs. The Star vs. La Presse battle that ensues yearly. I would also note, with some interest, that not one of the nominees or winners was recognized for anything to do with education. I had not planned on posting again until Monday, but I couldn't resist when I saw this this go up thanks to Nathan Taylor at the Orillia Packet and Times (once again scooping the Barrie paper). Most of the story focuses on very operational-level stuff, with some insight into the reading recovery program that is also in the budget mix. A staff recommendation and some support it's getting is mind-boggling. To save about $240,000, trustees are being asked to approve a measure that would see principals at schools with less than 200 students take on teaching responsibilities for an average of one day a week. “I think it’s in the best interest of the students to not have principals teaching,” said Jodi Lloyd, trustee for Ramara, Severn and Tay townships. Many of the smaller schools don’t have vice-principals, so to take their principals out of the office even for a day is a concern, she said. The solution to that is simple, said Orillia trustee Debra Edwards. “We simply won’t ask principals to attend so many meetings out of their schools,” she said. The “teaching principals,” as they’re being referred to, will be at schools that don’t have the enrolment to warrant full-time principals, she said. OK, I could be wrong on this and it's too late and I'm too tired to check. When the school foundation grant was created, it was meant to address school-level costs not adequately funded by per-pupil funding in smaller schools. It's a per-school grant to cover the cost of a full-time administrator, secretary and custodial top-up, in addition to some other items. So is the Simcoe County board proposing taking part of this per-school funding to turn their full-time principals into 0.8 FTE principals in these smaller schools? Is this happening anywhere else? I had thought the "teaching principal" had disappeared from the lexicon of Ontario elementary schools three or four years ago. I will update this post Monday if there are any corrections needed. Director of ed Mary Anne Alton works for the board of trustees. If they don't know that, it's about to get much clearer thanks to Bill 177. That they would allow her to restrict who they speak to and, apparently, act as gatekeeper and babysitter is hard to swallow. Alton was in the audience last night and said afterwards that trustees are encouraged to follow the communication guidelines approved by the board. “These (guidelines) ask people to deal with issues close to the source or the issue. Trustees are always free to have conversations with staff that are consistent with the agreed upon processes,” she said. There is a line between trustees having access to listen to their constituents and providing those same people with direction. The board of trustees should only be able to, through vote, provide direction to one person-- its director of education. The DirEd is then the one who carries out that direction. Vice-versa, the director is responsible for ensuring trustees get the information they require from staff to make the decisions they're tasked with making. There shouldn't be any limits on the information trustees receive however, be it formal or informal. A trustee's role should be policy, governance and representing his/her constituents at the board table-- not calling on individual staff and asking / directing them to address the bus schedule on route 12. As to the line on staff being asked not to speak out publicly, I can understand the request (doesn't mean I agree). However what's lacking is an assurance the fix-its will meet with employee groups (in private or otherwise) and address their concerns publicly through their eventual report and recommendations. In addition, I wonder who had the expectation this was going to be an opportunity for a public lynching. I'd always understood (based on coverage and assumption alone) it would be a mediated meeting. Middlesex County politicians have been front-and-centre for over two years now speaking to their concerns with accommodation reviews impacting their constituents. This odd-shaped county, which surrounds the City of London to the west, north and east, covers a vast chunk of Thames Valley District School Board territory. Its own administrative headquarters still lie within the city (similar to the Wellington County / Guelph scenario), and its politicians and residents are consumed with an identity of not being London. The county is dotted with schools, small schools, many built in the days when K-12 education was still controlled by township boards. Its few high schools located in the towns whose ratepayers could support the cost of building and running them. In the first round of TVDSB reviews, two committees were struck to look at schools in the 'north' and in the 'west.' In split votes, trustees accepted the recommendations of staff over those presented by the committees, even though the final report from the north committee contained the most unique, well-developed recommendations out of all 10 first-round reviews in the Thames Valley. It had involvement (perhaps too late) of the county, the local townships, the agricultural society and even nearby a First Nation. Communities involved in both reviews petitioned the outcomes to the Ministry of Education, and two separate reviews were granted. Both the first review and second made some recommendations but essentially confirmed the board's policy was in keeping with ministry guidelines. Some key passages from the most recent (both completed by former ed minister David Cooke). The ellipses indicate where I have skimmed over the portions in between each paragraph. Mayor Doug Reycraft and the Petitioners make a strong argument that small rural schools are hubs for their communities. The difficulty with that argument, in the case of Caradoc South and Metcalfe Central Public Schools, is that there is no community use of these schools. I am sure that the board would argue that they cannot afford to staff the school as a community centre and perhaps that would be a Municipal responsibility. There is a conflict here between local communities who fear the loss of a rural way of life if small rural schools close and a School Board that believes student success must come first and that must be achieved through equitable access to programs for all students. If it is Board policy to achieve program objectives by accommodating students in elementary schools of 350-400 students, then the Board should be clear as to why this is important and what the impact will be on student success. Over time Trustees will be able to measure the impact of this direction. The Trustees must then hold the Director accountable for the success of this approach. If this direction is official Board policy then ARCs should be informed that accommodation plans must reflect this fact. This approach might avoid raising false hopes regarding the future of some schools and might result in ARCs working on recommendations that fit Board policy. The evidence is overwhelming that the Board did not violate its policy and procedures. The Board’s response to the specifics in the Petitions is supported by ARC minutes and Board minutes. The Administration’s response and analysis of the ARC report is comprehensive and demonstrates that the Board did take the ARC report seriously and they valued the work of the ARC. These passages reinforce various grievances over an utter failure of boards and the ministry to explain the ARC process. Despite all this, Reycraft and others realize the 'true' fight is not with their local school board, as reported by the Strathroy Age Dispatch, despite taking every opportunity to chastise and criticize the board for its decisions. The paper also supported the point with an editorial. I would quibble with the way Reycraft characterizes the fight against small rural schools. The challenge, though exacerbated by rural, is not uniquely rural and applies to all small schools. The untold story out there would start with ministry funding, policy and provincial framework contract agreements and trickle all the way down to the classroom showing all the steps along the way where K-8 schools of 100 students (even if they fill the small building they live in) in southern Ontario will continue becoming more and more challenging to run, and how maintaining these could create a two-tier small/large school system-- where those who went to a small school have the community but not the programs and the large schools have more of the latter and less of the former. The Orillia Packet and Times reported late Tuesday of the 100-plus redundancy notices sent to teachers as the Simcoe County District School Board deals with the need for 78.5 full-time equivalent fewer teaching positions across its district. This is a good piece that explains the redundancy process and how the notices may or may not actually translate into job losses. It also adequately explains the lookout for those heading into and coming out of teachers' colleges. Kudos to the P&T and Nathan Taylor for snatching this story on a board whose meetings in Midhurst I don't believe they cover. This has been foreseen for several years now-- declining enrolment and teacher staffing tied to enrolment means there will continue to be a need for fewer teachers over the next year or two. "Full-day learning learning for four- and five-year-olds" (Ministry of Education lingo) or, more simply put, the prospect of full-day kindergarten, may change the outlook but that's only if Dr. Charles Pascal recommends it be led by teachers, and the government follows. There's an entire early childhood educator industry out there (who now also have their own college to certify them, etc.) that has a valid argument regarding its place in the answer. Even if it does go to teachers, it only has the ability to double the number of kindergarten teachers, the smallest grade cohort in many boards. It could mean thousands of positions when after a year or two of redundancies and thousands more graduates coming in the bottom end, the chances of full-time contract employment right out of TC are still slim to none. Then again, I've also been saying that about journalism schools for the past several years. Every year colleges and universities churn out hundreds and hundreds of graduates (most of whom never enter the field), some of whom compete for a very skant offering of decently paid positions. Given the thousands laid off in Canada over the past three years, it's a meagre market even for the best grads. So, yeah. I know what the situation facing teachers' college grads is like. The latest update out of Owen Sound on the review of the Bluewater District School Board whose first of two public input meetings is scheduled for tonight (May 19) Wednesday, May 20 in Owen Sound. “There hasn’t been adequate public notice and that’s our big concern — there isn’t enough time for people to work it into their schedules to attend or prepare any type of submission,” said (Bluewater Citizens for Education spokeswoman Karen) Cameron, who helped spearhead the citizens' advocacy group after the BWDSB came under fire publicly two months ago for a variety of alleged improprieties, including a lack of transparency, accountability and openness. The article provides some comment from Yenssen refuting Cameron's critique. It leads to the question of how much public notice is enough public notice? Were the members of BCE expecting every parent to receive a personalized phone call from their trustee? Yes, letters and notices stuffed in school bags are frequently neglected, and it's hard to find a critical mass of people who subscribe and read their daily / weekly paper just for the public-notice section. However I find it very hard to believe those interested in speaking at these meetings weren't aware of the dates and locations the moment they were announced. Either through the board's own distribution or through the vast local media coverage of this saga. Which, if you look at the time line, by the way, the dates were announced May 6, two weeks less a day from the first meeting on May 19 May 20. I would hope the most eager presenters had started drafting their comments on April 21, when the decision to hold meetings was announced but dates hadn't yet been finalized. The skeptic in me sees this as the citizens' group's escape clause for this process. If they do not like or agree with the end result, they can then point back to this weekend and say the process was a sham because of the "lack" of public input. If 12 people -- the same ones who've already spoken up previously -- show up at the two meetings, the group can claim it's because of ineffective public notice. Or maybe it'll just show how much people really don't care. I am a frequent attendee as media at many public meetings where there was plenty of adequate public notice-- often where I am also the only person in the room who isn't on the payroll. I really hope to be proven wrong, but the BS detector went off reading this one. The Pembroke Observer posted this story over the weekend, regarding Renfrew County politicians' 'crusade' over staggered bell times that have been announced and are being implemented for September 2008 in public and Catholic schools in that area. I'm surprised this area doesn't already have staggered bells, as I would suspect a good majority of boards have double-run buses for years with high schools starting earlier and elementary schools starting later. Second, I hate to be so brash, but so what? Staggered bells is only the beginning in an era of mandated school bus consortiums across the province, particularly in a year when the Ministry of Education is telling boards they need to reduce their transportation costs by one per cent next school year or the ministry will just cut the budget by an equivalent amount. One of (Township of Greater Madawaska Reeve Peter Emon's) concerns regarding staggered bells is the expense to municipalities and to the county of having to have roads open sooner following snow storms because of earlier bus runs. In addition, he feels families will face difficulties in finding child care, and employers will have problems accommodating staff that are requesting to finish work earlier to get home before the school bus. Are these legitimate concerns? Really? Is the county only plowing roadways for 8 a.m. right now? What about those who need to be on the road earlier than this time? I realize many counties don't provide 24/7 routine winter maintenance (my local county provides 7 a.m. - 11:30 p.m. coverage, on-call outside those hours-- which means the roads are clear for 7 a.m.), but they tend to have their day shifts on in time for the morning commute, which is usually not judged by school bus times. Also, to the childcare and other concerns-- many of those leaving school earlier as a result of this change will likely be high school students. Last time I checked it was extraordinarily difficult to find childcare for a 14-year-old child. As to Emon's points on 'local' policy being dictated from Queen's Park, I don't think there would be much objection to that from either an educational or municipal perspective. The Sarnia Observer posted this story Sunday about a group of parents who want the Lambton-Kent board to reverse the retreat on rotary instruction for intermediate students. “Our point is, ‘Why wreck a good thing that doesn’t seem to be broken?’” asked Sandy Laird, who has sons in Grade 5 and Grade 8 at the school. Hrm. I wonder how these same parents would feel about sending their children to a Grade 7-12 school, where the Grade 7-8 students would receive rotary instruction by default. Not mentioned (not asked?) is whether the move away from rotary may have anything to do with declining enrolment. Fewer Grade 7-8 classes in each school likely makes it much more challenging to do rotary instruction. Picture it-- you have a split Grade 6/7, a split Grade 7/8 and a Grade 8 class in your school. How do you do rotary in that mix? Take out the time students spend with their French teacher and (where applicable) their music/drama teacher out, and that's still a lot of time left in the schedule with only three teachers who can rotate between classes. It's not impossible, but it becomes a greater challenge. Ditto when you make that even smaller -- say only a split Grade 6/7 and Grade 7/8. Or, even smaller (and there are an increasing number of schools out there where this is reality) with one Grade 7/8 split. How do you do rotary then? This is a few days old but still caught the eye, after the night of presentations at the Simcoe County District School Board on its north-Simcoe high school review. The communities came out in force and presented their piece to the trustees. It brings up a good question of how to cover these processes from a media standpoint. As readers here will know, I advocate for better coverage of accommodation review committees, their meetings, their recommendations and the overall review process. Coverage that puts policy and fact at the forefront with an aim for rational coverage of the issues at play that doesn't get distracted by NIMBYism or the passionate responses a school-closure threat ultimately evokes. Coverage that makes up for the boards' and ministry's lacking effort to explain how the review process actually works. But when it comes to a night like this, there's not much a reporter can do other than relay the event as it happened. If the evening turns into a love-in for the communities at stake, is it fair reporting to counter the opinions presented with information from earlier in the review process? Or is it just best to replay the events as they occurred, and leave the rebuttals (if any) for later? Often this is further clouded when local media get involved in the save-the-school efforts-- I had experience with staff (not the reporter) at a sister paper being heavily involved in save-the-school efforts, making the paper a de-facto school supporter and creating no opportunity for the reporter to report on anything she felt would go against the party line. Some curious recommendations from the Toronto District School Board's nutrition task force regarding the board's middle schools. The National Post reported on the recommendation heading into the program and school services committee meeting earlier today, focusing solely on this recommendation, the 13th of 15 in the report. It recommends staff review and comment on middle-school students being kept at the school over lunch periods unless they have specific permission from parents. It left me wondering if the reporter actually read the other recommendations. Mr. (Gary) Crawford said he doesn't like the prospect of the board forcing children to stay in, especially because many middle schools in the city don't have cafeterias. "Do they provide cafeteria food? Not necessarily. A lot of them have vending machines," he said. "If [students] have the money and they're walking home, they'll go after school anyway." Well, if both the reporter and Crawford had read the entire report, they would have seen recommendation nine, which asks the development of cafeterias be included in the board's capital and facility planning. If the reporter did read that part, where's the followup question? Where's the clip from the report's author speaking to Crawford's concern? The other recommendations dealt with the creation and promotion of healthier, local options for cafeteria lunches. There's some thought in this report to the issue of poor diets and nutrition in this age group, with an apparent goal of trying to reinforce healthy eating habits at this age that could carry into adult life. Thinking about this reminds me of Jamie Oliver's school lunch campaign in the U.K. The District School Board of Niagara has struck an accommodation review committee for its schools in the City of Welland. The local paper published this article meant to review and introduce the process to its readers. The reporter made an interesting choice here-- rather than go to the community for the all-too-easy "don't close my school" emotional response, she stuck to the school board's superintendent and the Welland trustee. Once the committee has had time to review things such as enrolment, state of the buildings and opportunities for consolidation it will make recommendations that will go to the board. Senior staff will also come together and make its recommendations which will also go to the board for a final decision. This cannot be repeated often enough, and for the sake of understanding, here's hoping the Tribune does so in its coverage next year. Of course, that's if the paper covers the regular committee meetings. I've had to fight in my own newsroom to continue covering committee meetings, and many newsrooms both larger and smaller than mine have simply abandoned any attempt to cover them until they reach the final-recommendation and report to trustee phase. At one of the first ARC meetings, Blyth representative David Sparling said that an Avon-Maitland employee had told someone he knew the board was going to recommend the closure of two schools and move the 7 & 8's into F.E Madill. The board assured Sparling at that meeting that the decision had not been made, that did turn out to be the case and Sparling says if in fact they knew last fall-----why go through the review process. The decision hasn't been made until trustees vote on it. As to having to go to review or not, the board has to strike a committee whenever school consolidation or closure is anticipated as an option. It has no choice under the ministry guidelines. If trustees turn down the Grade 7 and 8 option, the board may then be faced with having to strike a review of F.E. Madill and other secondary schools. If the intermediates move, there may be room for a petition to review, which ultimately doesn't change the outcome. Other boards whose first-round reviews were subject to review have revised their pupil accommodation policies to encompass feedback from the ministry appointed reviewer-- and in some boards this has included more explicit sections on how to 'grow' an ARC beyond the schools included when the committee was struck. Essentially, these reviews are telling boards trustees can / could have expand(ed) a review to include more schools if the committee had requested it. Board decisions are subject to judicial review at the Ontario Court level if parents choose to take it that far, however even these legal decision have usually supported the trustee decision. Two separate articles on high schools involved in an accommodation review in the northern Simcoe County communities of Penetanguishene and Stayner, as the community leaders, parents and residents in those communities prepared for presentations to trustees on Thursday. Both show the fallacies and complete misunderstanding of the accommodation review process. In both you'll find outrage from community leaders and/or review committee members that board staff haven't considered the review committee's recommendations. As stated here before-- trustees are the ones deciding here, not administrators. If administrators agreed with the review committee's stance, they wouldn't have recommended the schools for closure in the first place. The conclusion of the committee process is not meant to necessarily result in change in the recommendations coming from administration. It's meant to provide public opinion and recommendations to trustees-- who should then be weighing one set of recommendations against the other and choosing the best option(s). The committee itself is partially at fault here since its recommendations showed only an inability to reach a consensus on consideration of any one school's closure. The "keep all schools open" consensus position ignores the realities and reasons why the review was struck in the first place. The recommendations didn't address the reasons leading to the review in the first place. In a lengthy motion approved on Monday night, (Clearview) councillors also stated the staff report recommending the closure of Stayner Collegiate to be "inadequate, incomplete and unjustifiable," and "as a result, faulty in its logic and conclusion." The motion also notes the staff report provided a "total disregard to the public comments... (and) contradicts the fundamental principals of the provincial Places to Grow legislation." Council should read the Places to Grow Act and the related Greater Golden Horseshoe Growth Plan. It doesn't call for a booming expansion of Stayner. Simcoe County is identified as a target for growth, within its large urban centres (IE: Barrie, Orillia). If I reported in that community, I would also be among the first to remind council of its stance here the next time it makes a decision that runs contrary to public comment. From the Penetanguishene article, I got a kick out of the trustee's comments on the local French high school and PSS' French immersion program. Penetang is probably the most bilingual community in southern Ontario between the west end of Ottawa and Windsor... the comments make sense. Yet it also shows how the Declining Enrolment Working Group's recommendation to force boards to work together on space issues made sense. French boards have received millions in capital to finally have schools of their own, at the same time as English boards conduct accommodation reviews. I first thought this would be a fairly pedestrian piece on balanced-day schedules for elementary schools vs. more traditional schedules and it certainly starts out like that. I was preparing for a rash of school board people expounding the virtues of 100-minute blocks and two nutrition breaks, etc. (there is some of that) countered against parents' concerns over the loss of a long lunch hour and kids not being able to walk home from school for lunch, etc. Dan Russell, principal at Dufferin Elementary School in Owen Sound, said he can't prove literacy test scores have improved because of the balanced day, but scores have improved. He said he was skeptical about the balanced day concept because he was concerned it would diminish the opportunity to run house league sports and other lunch-hour activities. But having two breaks provides double the opportunities for extracurricular activities, he said. It also improves student behaviour because kids don't get bored in the playground during the 40 minutes they have now after eating lunch, he said. Even if balanced day has no effect on literacy rates, he'd favour it over the old way, Russell said. "Even if I can't prove the instructional piece, I can still justify it and favour it because of the other piece." Well done, and kudos to the Sun Times' Scott Dunn. NDSS's enrolment will again be a topic of discussion at Tuesday's board meeting when trustee Gary Atamanyk will ask for a one-year extension to hit the board-imposed target of 350 students to spare the school's shuttering. This is the peril facing the board that came up with a very unique decision-- a time line and challenge to boost enrolment at NDSS. However, if the challenge isn't met, how many times should the time line be extended? Before the Gerard Kennedy requested moratorium on school closures, the funding formula-driven accommodation reviews of the day were big on numbers. The range of 900 was always identified in Ontario as being the range where a high school hits its glorious peak in terms of being able to offer a breadth and depth of program. However, while I suspect there are more students attending schools with populations larger than 900 in Ontario, I also suspect there are far more schools in the province whose student population settles in somewhere between 400 and 700. These mid-size schools can offer a depth and breadth of programming to serve all the relevant pathways in the curriculum. However-- the question not asked in this article (it has come up in prior coverage of NDSS and other small high schools) is how small is too small? A population of 250 gives a distribution of about 50-60 students per grade with the exception of Grade 12 with its average 20-30 per cent return rate making it a larger cohort. Several things can happen: Subconsciuosly the school starts tilting is credit offerings to one end of the scale (usually college and university) pushing all the other students out to other, larger, schools that can serve their pathway. Or, the school ends up multi-grading or multi-levelling its classes. So you'll never get a standalone Grade 11 university French. You'll get a Grade 11/12 split class, or a Grade 11 class with university and college students. Or, horribly for the teacher, both scenarios in the same class. The article almost seems to suggest the former-- quoting a school supporter saying the school should concentrate on academics, but also noting the NOTL area has 700 high-school aged students. Hrm. It leaves one to wonder where the 450-500 students not attending NDSS are going and why (a football team? Sorry, couldn't resist). There are of course ways to run small schools-- go north of Thunder Bay or Sudbury / Timmins and every high school would be considered tiny by southern Ontario standards. Those schools make it work, some how. Or look at French-language schools in the large pockets of southern Ontario where there is no established Francophone community. A local French Catholic high school in my area has 75 students in Grades 9-12. I would suspect a big part of the reasons why the solutions in place at those schools aren't being attempted or finding success at other schools is money. Two hits today on matters relating to student success and credit recovery. First, this weekend was the coverage of the Ontario Catholic School Trustees' Association conference in Toronto that high school students need chances to succeed, not automatic zero-grade marks that shuttle them out the door and onto other things without a high school diploma of any kind. In an interesting aside, I noted the Toronto Sun covered this and nary a mention over at thestar.com. The Star has two full-time education reporters-- the Sun... has about nine reporters on its city desk, total. Minister Kathleen Wynne told trustees that while there have to be consequences, students also need a supportive environment that allows them an opportunity to try again. "Do there have to be consequences? Absolutely. Do kids have to learn to take responsibility for their work? Absolutely. Can kids get zero on an assignment? Absolutely," Wynne said to about 500 people in attendance at an airport-area hotel for the 79th annual meeting of the OCSTA. "Is zero the first thing that happens if they make a mistake ... or they don't live up to the standards? Probably not." She said she rejects the position that failure is a "measure of rigour" in the system and that high schools can no longer be seen as a "sorting mechanism" where students who are academically capable are pushed ahead while those who are technically skilled are steered in another direction and those who show no desire or aptitude are left behind. "We can't have more than 20% of our kids not get through high school, not get that certification," Wynne said. Consultant Damian Cooper, who has advised the Ottawa-Carleton District School Board on assessing and evaluating student achievement, argues that in today's knowledge economy every student needs to leave high school with literacy and numeracy skills. It's up to educators to figure out what works for each student, not merely to separate the wheat from the chaff and send the wheat to university and show the chaff the door. "The job of school is no longer to sift students into the smart, medium and dumb groups," says Cooper. All of which feeds the questions asked the last time-- are credit recovery, et. al, programs simply part of a self-esteem movement or are they trying to make sure every student gets support to get a high school diploma? This is also interesting given Ontario PC leadership candidate Tim Hudak's plank on (the return?) of high school exit exams. I have difficulty seeing, without further explanation, how the university bound student and the school-to-work student can even be eligible to take the same exit exam when their destinations are so drastically different. I saw this a few days ago at Crux of the Matter, where Sandy posted about Ontario Progressive Conservative leadership candidate Tim Hudak's platform on education. I knew immediately I needed to go and compare the education platforms (if any) of the four candidates for the leadership of the party-- given the party's 2007 blunder on faith-based funding and Premier Dalton McGuinty's desire to be known as the education premier, education could rear its head again as a dominant issue in the 2011 provincial campaign. Hudak is the only candidate to have a clearly enunciated platform plank on education, featuring four elements. Klees has been his party's longtime education critic. One can quickly take a peek with a simple search at his various positions on the government's record on education through his statements in the legislature and on his website. It's disappointing, however, given this track record that Klees has nothing on his website indicating what his entire education platform is. The only thing I could find that was close enough was his statement on autism coming out of the government's track record on ABA and other therapies for children with autism. This relative newbie to the legislature doesn't have anything overly specific to education on his leadership website. The interesting reading on the subject comes under the section of his site where he solicits policy ideas from anyone with enough time to fill out the web form. Several of those who have submitted ask Hillier to take on voucher / charter schools as part of his platform. One in particular asks for a greater emphasis on science within the current curriculum. Given Hillier's politics (he has an interesting history as a property owners' rights advocate and has written for separatist publications in the past) he is easily the most rural, conservative candidate on the ballot. Like the other two above, Elliott has nothing explicit on her site about education. The word gets only three hits in a simple search, with one referring to Northern Ontario, one on her flat-tax plank and the last on educating us about the ills of addictions. The Tories are five days away from the deadline to sign up new members eligible to vote for the new leader. Education is the second-largest expense on the government (after healthcare), and only one of the candidates has explicitly listed where he would take education in this province. Dealing specifically with Hudak, I would wonder whether he's been paying attention to what his family has been experiencing. Phonics is used as part of the toolkit in both early years and primary grades as children learn to read and write. This reporter has witnessed it first-hand in a number of classrooms. On the matter of a high school exit exam-- isn't this one of the roles fulfilled by the Ontario Secondary School Literacy Test? Students cannot obtain their Ontario Secondary School Diploma without passing (remembering that a Level 3 is roughly equivalent to a B mark) the test or the Ontario Secondary School Literacy Course. I would also question whether an exit exam would really help all students. If I'm in a school-to-work program in high school, do I write the same exit exam as the student heading for university? Our post-secondary outcomes are drastically different. I'll try and keep an eye on any developments in these candidates' platforms until the vote in late June. Hat-tip to Sandy (and her own source). Some information now coming out as to the origins of the loss of public confidence in the Bluewater District School Board. According to this article, part of the issue was a refusal to return to 'rotary' teaching for intermediate grades at several schools. Rotary teaching is where the staff teaching Grade 7 and 8 students stick to their teachable subjects and rotate through a school's intermediate panel. It offers the benefits of having subjects be taught by curriculum experts -- IE: math taught by a teacher whose university degree is in math, science taught by a science grad, etc. Senior administrators made the decision to end rotary and go back to a single-classroom teacher style without any public consultation or vetting by trustees. Parents' issue is this decision was significant enough that it would have required this consultation and approval under the Ontario Education Act. For the true benefits of rotary instruction, especially for all students in a board with a geography like BDSB's, there would have to be more than two or three Grade 7 and 8 classes in a single school. With few classes, teachers can still split and share classes by subject (not including any specialist teachers who may come in to teach music, French, etc.) but that's not really rotary. To have true rotary with so few classes, teachers would be in their cars travelling from one school to the next-- and they're far too valuable to spend that much time outside the classroom. Of course, I'm a little biased here. I attended at Grade 7-OAC school and we were able to take full advantage of a rotary style program. My English teacher was an English major who taught nothing but English, and so on, because between Grades 7 and 8 there were between 250-300 students and approximately 10-15 classes. Curiously, I wonder how these same parents who want to return to rotary would feel about a 7-12 school. In a related issue, the Sun Times published an opinion piece on the Governance Review Committee's report, hoping its recommendations would lead to the improvements needed within the BDSB. A followup to the football musings from yesterday relating to the viability of Niagara District Secondary School in Niagara-on-the-Lake. Another idea to boost enrolment at the school was the introduction of the International Baccalaureate, a well-respected curriculum and specialty high school program. This is the sort of magnet program known to attract out-of-area students to high schools for the prestige of the program. There are no other schools in the District School Board of Niagara district offering the IB program-- in fact the closest school listed is in Hamilton. Enrolment needs to reach 350 students at the school by the count date on Oct. 31 in order to prevent the school from closing. Two pieces from the Kingston Whig in the last couple of days regarding a pellet gun incident at a local school. The first is the news story on the incident itself, the second an opinion piece on how the school board handled the incident. The way these sorts of situations are dealt with has changed some in the last few years, as a result of amendments surrounding student suspensions, student expulsions, etc. The goal is to divert, but not to outright kick a student out of school. It's still interesting to see how each board handles these things as they arise. Take for example the report of a fight at a Belleville high school leading to hospitalization for one student. What's the right answer to these situations? I'm no insomniac, but did want to read through Bill 177: The Student Achievement and School Board Governance Act, 2009, since this post had alerted you all to its existence. First, reading this bill is much simpler if you open up a copy of the Ontario Education Act in another tab or window so you can flip back and forth and make sense of the various sections of the act this bill repeals and amends. Remove all references to "co-curricular" activities, the act's jargon for extra-curriculars such as sports, clubs, etc. Clean up a number of sections of the act implemented in 1996-97 relating to the creation of the 72 district public and Catholic boards on Jan. 1, 1998. Give the minister the power to set "achievement standards" that boards must meet. Boards have to develop plans to meet the standards set by the minister. Specify trustees' role -- oversight, governance and ensuring the board's plan to meet the minister's standards is met. The only employee they can direct to do anything is the board's director of education. Compels all boards to adopt a code of conduct as issued by the minister, which they can amend to include additional clauses. It also lays out the reprimands available if a trustee contravenes the code. Mandates every board to establish audit committees-- the composition of which is determined by the minister through regulation. Specify directors of education's roles as to the implementation, evaluation and accountability for the board's plan to meet the minister's standards. Allows boards to change the number of trustees-- they would apply to the minister, who would then approve the ability to add the extra seat(s) for the 2010 municipal elections (a similar process is used for municipalities who wish to change the size of council). Removes boards' abilities to issue debentures (this one will require further explanation). Makes a small tweak to the sections on boards sharing facilities. The meat of the bill is still the student achievement standards, which the minister would set through regulation. Though the current minister has a variety of committees, partnership tables, etc. she could consult, the danger of governing by regulation is that should the government change, the new minister of education has all the same rights to, essentially, arbitrarily conduct a whole set of sweeping changes to the way education runs in Ontario without any need to run it through the legislature. Due to the current nannygate taking place in the legislature, I haven't seen any reporting on this bill (which looks a little too involved to have been slapped together in a hasty response to this situation as suggested by a commenter here). Is football a school saviour? An interesting development in the campaign to keep Niagara District Secondary School in Niagara-on-the-Lake open. The District School Board of Niagara voted last year to give the school two academic years to boost its student population or face closure. The community efforts to increase enrolment in the first of those two years stalled, with enrolment remaining stable (or dropping). Now the school's football-playing alumni are a flutter over the principal's refusal to reinstate a football team at the school for the fall of 2009. The alumni claim the team alone would bring students back to the school in sufficient numbers to meet the 350-student goal set by trustees last year. This of course, assumes there are a critical mass of boys choosing to attend school in St. Catharines or Niagara Falls solely because of a football team. The principal, presumably with support from his supervisors, says bringing in a football team at NDSS will only kill other fall boys' sports such as volleyball. It's a realization the talent pool at a small school is just that-- small. Likely the only option would be for the school to have a varsity team with students from all grades instead of separate junior and senior football teams since each team needs 20-30 players to be viable. There are schools with 900 to 1,000 students who can pack a varsity team with 45 players but can't get enough to come out for a junior/senior combo. Could NDSS even establish a viable varsity team? Is this a desperate attempt on the community's part? If anything, the biggest thing harming NDSS (built for 1,000 with a current population between of approximately over 200) is the availability of busing for students wanting to access programs at other board schools. Kill the bus, and see if the students still vote with their feet to attend schools outside their own town. If they do, then what more could possibly be done to encourage attendance at NDSS? The proposed Student Achievement and School Board Governance Act would clarify what is expected from school boards, trustees, board chairs and directors of education. It would also promote sound financial management by establishing audit committees and creating a provincial code of conduct for trustees. Here's the fun part-- there are links from this news release to a backgrounder on the Ministry of Education website for our edification. However, as of posting, I cannot actually find a draft or first-reading copy of the "Student Achievement and School Board Governance Act" referred to in both. Either it hasn't been tabled in the legislature yet or the leg website hasn't been updated yet to reflect any bills introduced today. I later learned the bill had not yet been introduced in the legislature when this post was first written-- find a link to it here. You can blow sunshine up my patootie all you want, but until the actual bill is tabled and publicly available, I don't know what any of it means. Is this going to be another omnibus bill revising the Ontario Education Act? Is it going to be legislation full of references to "the Lieutenant Governor in council," meaning a shift of power to implement rules moving from the legislature to cabinet? Well, we don't know yet. Stay tuned. Media across the province are in the process of being advised of a series of upcoming announcements relating to an April 21 Ontario Ministry of Education announcement on facility and capital dollars for "green" schools. Boards have already been notified by ministry memo of their share on $400 million of a $550-million two-year pot of green. Those dollars are to be used for audits, energy management systems and high-efficiency heating, cooling and window projects. Asking the ministry when the remaining $150 million for capital expansions and improvements might be announced brought an answer of "soon." The advisories of the pending announcements at the local level fall into this April 21 cash. It's also extremely typical of how the McGuinty government enjoys spreading the education love around the province. It's actually a pretty beautifully orchestrated way of getting lots of positive coverage. Save the juiciest announcements for Premier Dalton McGuinty -- like, say, the Pascal report that we're still waiting for. The big but routine budget, program, policy items can be hit by Minister of Education Kathleen Wynne. On good-news items that have an impact on local schools, this government does a good job of farming those out to local MPPs. Within the span of a few days, the announcements generate tonnes of media hits across the province and I think that creates goodwill. Unless, of course, your riding voted Progressive Conservative or NDP in the last election-- in which case, you don't get a local announcement. The good things coming to your area get included in the list of things a Liberal MPP puts in his or her announcement, after the projects in his/her own riding. So, for example, say you live in Fergus and your MPP is PC'er Ted Arnott (a former parliamentary assistant to the last Tory education minister Liz Witmer, for those keeping score). Too bad-- you'll have to travel to Guelph, to the office of someone like, oh, I don't know, Liz Sandals, to hear all about how some school in Fergus is getting money to replace a smattering of inefficient portables with a permanent, energy efficient extension at the closest school. This Sudbury story on a rally for a Catholic elementary school in the city disappoints-- it follows a very predictable pattern for this sort of story. Even more so the embedded video. Quote parent talking about how good the school is-- refuting common perceptions that enrolment and teacher / program may be at the heart of why the facility is pegged for closure. The key line for me was almost a throwaway line where the parent says that yes, the school (facility) needs some work. Is that the real reason behind the closure recommendation? Admittedly, I don't know the paper's history on reporting this review or the issues-- this article does a poor job of providing any context a first-time reader might need. The kids quoted here are cute but don't add to the story in any way. Having "nice teachers" (story) or "liking gym" (video) don't tell me why the school is being considered for closure and give a better explanation of what the accommodation review recommendations were and what the staff recommendations were, other than the obvious closure of this school. On a related aside, this shows another occasional foible of education reporting-- interviewing children. They're adorable and cute but often prone to simple, one-word answers and often reporters just don't know how to speak to kids during interviews in a way that gets past monosyllabic responses. The volume of Ontario 2009-10 school board budget deficit stories is only going to keep getting louder as the next two months unfold. Ontario boards have to file a balanced budget with the Ministry of Education by June 30 or they risk being taken over by a ministry appointee and losing control of their board. Today / Wednesday's story from Owen Sound is disappointing-- especially given some solid reporting there recently given the issues of transparency and accountability exposed through letters and resignations. 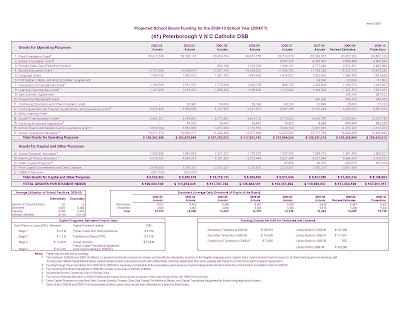 We learn immediately the deficit in draft budget is slightly over $4 million, on a total budget of $185.6 million. However we have to read well into the story before learning what is being cut in the budget and where the pressures are-- and even then the explanation is poor. The board is pegged to lose five per cent of its students over the summer due to declining enrolment. In a per-pupil, student-teacher ratio staffed system, it's to be expected the budget would include reductions in staffing on teacher, educational assistant and classroom support positions because these are all staffed based on the number of pupils. Fewer pupils = fewer staff = less grant = lower classroom salary budget lines. I don't see this as being a "budget cut," as the level of service (IE: the number of staff per class/school) should remain consistent if the board is staffing per the required ratios. The only unknowns, maybe, are how many retirements are expected and how many layoff notices may need to be issued. (Treasurer Brenda) Booth said there are “still a number of unknowns” with the 2009-10 budget because not all costs are in, staff numbers have not been finalized “and there a huge differential between the benchmarks provided by the ministry for staffing and actual costs." This issue has been dealt with and the ministry should be providing the board with an adjustment grant so that its revenues match expenditures and the board is given enough to cover the experience ratings within the salary grid matched to its actual staff. If the board doesn't have these dollars, it's because they haven't plugged a number in somewhere to their spreadsheet. The true story here is about the other shortfalls -- aside the three IDd by the ministry which are textbooks, computers and staff development. These reductions come from the ministry and boards have known since earlier this year their expenses need to match. Professional services has a large gap and so does office staff. So is it because these professionals' staffing levels haven't been adjusted in eras of fewer students? The office staff one confuses me, unless the board is overspending on its central administration. School office staff are funded by a grant outside the per-pupil formula, ensuring every school regardless of size has full-time office staff. Of course, most annoyingly of all, five people showed up for this first-ever public input meeting on a budget. This annoys the hell out of this reporter and I'm shocked to see it happening in this board, where parents, staff and others have been complaining about a lack of openness and accountability. So on one hand you want all that openness but when the door is finally thrown open and you're invited to a public input session on the budget, five people make the effort? One for the "blue pages?" The Near North District School Board moved at the beginning of this past weekend to shut down a teacher's website (classroom blog?) because the site published private student data. Apparently student health card numbers, home phone numbers and other contact information was published on the site. Superintendent Kelly Brown told the North Bay Nugget no student addresses were included in the information published. The board, when pressed by the reporter (the paper was tipped off by a parent), said the teacher involved won't be disciplined for the breach of privacy. This is the sort of situation that leads parents to complain to the Ontario College of Teachers about a member's conduct. Unfortunately, while these complaints do make the infamous "blue pages" summary in the college's member mag, they're also the ones that indicate the college didn't investigate as the concern wasn't one relating to professional standards. Or some other similar line indicating the college acknowledges the concern but won't be doing anything about it. Were I the reporter here, I would have, after lawyer's advice, published the name of the teacher involved or at least the grade. Here, we're all left to wonder who this person is who put private information on the web and won't be reprimanded for their inattention, ignorance or stupidity. Some of the Bluewater trustees spent the day interviewing candidates for the vacant Meaford and Blue Mountains ward, empty after the resignation of then-chair and trustee Rick Galbraith's March resignation. Having covered this sort of replacement process before, it's not unusual and is permitted by the Ontario Education Act. It flies in the face of letting the people who elected Galbraith have a voice in the selection of the person who is to take his seat at the board table for just over a year. Further, if my confidence in this board's abilities is already shaken, why would I trust the people overseeing the staff and director of education now being helped by "Mr. Fixit" and his crew to appoint someone for the second time to that seat? The BDSB should have asked the people who they want to fill the seat, not each other. If memory serves, this article is only the second to cross the desk regarding actual layoff notices being issued to staff at the Peterborough, Victoria, Northumberland and Clarington Catholic District School Board. Aside the more, er, routine nature of these sorts of notices being issued in a time of budget development and declining enrolment, it comes as no surprise it should be happening at this board. The day of the release of the Grants for Student Needs, I wrote about how out of 72 publicly funded school boards in Ontario, only one -- this one -- would actually see its grants decline from 2008-09 to 2009-10. Closer examination shows some one-time funding accounting for the majority of the year-to-year difference. This is not an area of the province where there would be significant growth in the school-aged population-- so they're dealing with the double-whammy of losing revenue (and related staffing expense) for the students that are graduating and not being replaced as well as dealing with a grants chart showing minimal increases for areas not directly funded by the framework agreement reached with employee groups. That means two things: declaring a number of teaching and support positions surplus in ratio to the decline in students and then, one would hope, going through the budget with a fine-toothed comb to ensure other staff positions can be paid for through what you're getting in grant. There are just under two months left before board budgets are due and the layoffs are confirmed (or not) by trustees.